I painted the test model for this squad a while ago. So long ago that I had to go back to my first post and look at how to paint them. If I didn't blog, I don't know how I would keep track of painting recipes. Would you believe that I'm using a bit of an assembly line process for these guys. I've got them all primed along with most of the shadowing done. Now I'm working on getting their armour finished before I go back and add the final edge highlight and deep shadows in key places. These guys have their shadows done and are patiently waiting for their turn at the armour paint shop to get their color added. I seem to be moving fairly quick through them. At this point, it takes just over two hours to get one of them completed to the point where I'd say his armour is painted. I figure it will be about three or four hours total for each guy in the end once I add all the smaller details onto that. It'll really stand out once you add the green and the red. Is this your army or a job? Very impressive Ron, I love the subtlety of the shade you are going. I am really digging this monochrome look, you've done a great job with it. Thanks guys. I spending all of today working on the squad. While I won't be able to get a single model completely done since I'm doing it assembly line style, I will get the whole squad's armour completed today. I'm trying to take some pictures as I go along to show the progress. Reece: This squad is for someone else. I'm torn between doing this on my army or going with the old school black armour. Looks great so far! I've got to ask, though, where did you get the fancy shoulder pad for the flamer termie? I'm making a Deathwing army myself and that looks too good to pass up. 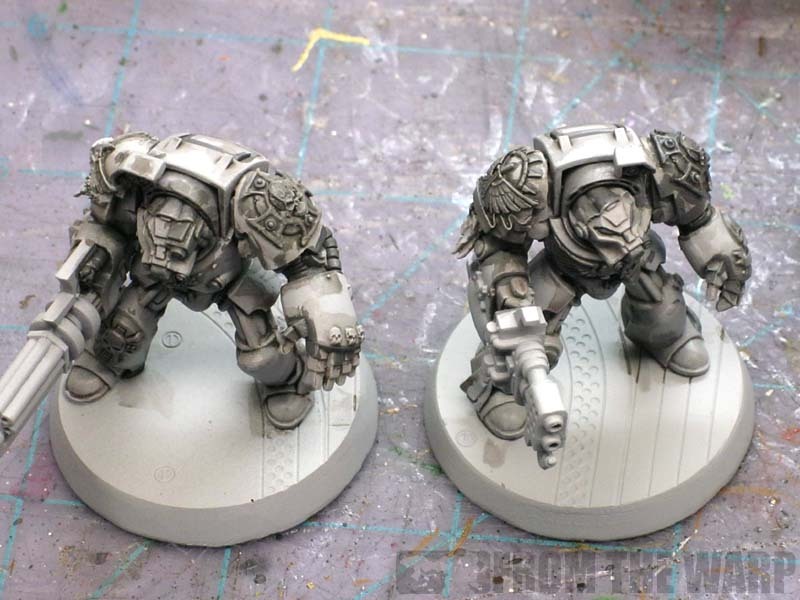 Jim: They are the Forge World Dark Angel shoulerpads. After seeing them on the models, I'm glad that I ordered a few sets for my own army. They do add considerable detail to the models and give them a nice feel. May I ask how you get the white so clean against the dark recesses? Did you start with a black undercoat and highlight up to white? Or did you do something else? It looks fantastic! Flanagan: It starts as a grey primer so that minimizes the number of coats. That and there is no white on the models. It's a blend from light grey to Dheneb Stone on each individual armour plate. I'll be posting a huge step by step in the coming weeks for those sick individuals looking to duplicate the effect on their own models and cause tremendous pain and suffering in their own lives. I've always liked white/grey termi's. They always look more "sci-fi" for some reason. Like Space wolves land speeders... it's like they're meant to be that colour. The subtlety of your blending is absolutely bang on the money, fantastic looking mini, and much cleaner than the standard bleached bone. Cant wait for the tutorial, and I really hope you paint a Dread' up in the same manner. Stick it on a blue ice base... t'would look immense. Dave: I have some shots for the tutorial. It's going to take me some time to write it up though. I'm going to limit myself to the armour only though as the rest can be done like normal. Hi, I know this is a complete novice question (but i am one) Which primer did you use? What shade of gray is that? 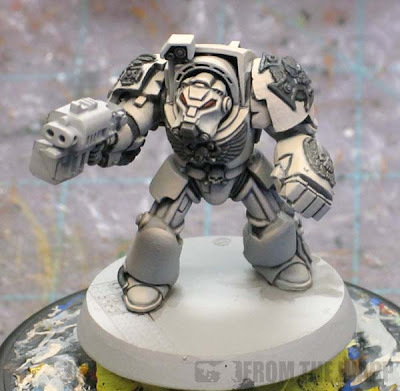 do you have a beginning section of how to paint a miniature in terms of shading and what you did here? Unknown: Not a novice question at all. I'm actually putting together a post about the two kinds of primer I use when I paint. In this case, it was a light grey primer I picked up from walmart. Very cheap stuff, but works really well for me. I do have a beginning series that covers some painting basics and it can be found here: Back to Basics. The archives are another great place to find stuff too. I post all my tutorials there once they are posted.